An international team of five astronauts re-emerged on Sept. 21, 2011, after living in a cave for six days as part of an elaborate training exercise that simulates aspects of a real space mission. On Friday (Nov. 4), six volunteer astronauts will "return" to Earth from a mock mission to Mars, after spending 18 months isolated from the world in a special facility in Moscow. But the Mars500 crewmembers are not the only ones who have faced extreme conditions in simulating a real space mission. An international team of five astronauts recently completed a spaceflight training mission in Europe that required them to live and work in a dark and isolated cave for nearly a week. The September training mission was organized by the European Space Agency to simulate aspects of a real space exploration mission. The astronauts were stationed deep within a complex cave system on the Italian island of Sardinia in the Mediterranean. 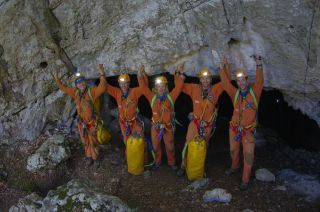 For six days, the astronauts lived and worked in the island's caves, exploring areas that are unmapped and largely undisturbed, as part of the CAVES 2011 expedition. The crew re-emerged to the surface on Sept. 21. The CAVES 2011 exercise was designed to simulate aspects of a spaceflight mission, including operating in a potentially dangerous environment and working with an international crew. Five astronauts that took part in the European Space Agency's CAVES 2011 mission gather at their campsite for daily debriefings. Bessone has used caves as training grounds before, but this recent excursion was the first that included such a diverse group of astronauts. The team was made up of European astronauts Tim Peake and Thomas Pesquet, NASA astronaut Randolph Bresnik, Japanese astronaut Norishige Kanai, and Russian cosmonaut Sergey Ryzhikov. "Everyone was focused and we had a great time together," Pesquet said. "Being in a cave was something like mountaineering, but much more challenging — with isolation, darkness and the need for full situational awareness to avoid snagging ourselves on sharp rocks or crevices." Despite the physical challenges of living in a cave, the astronauts also had to cope with language barriers and cultural differences, which proved to be a valuable lesson, and one that spaceflyers often have to deal with on real missions. Taken during training preparations, this is a view of the valley in Sardinia, where five astronauts took part in the European Space Agency's CAVES 2011 training mission. "It was a rare opportunity to experience problems encountered during a space mission in a training environment," Peake said. "Our mission required teamwork and working through problems as a small international team where different cultures and primary languages require consideration." The CAVES 2011 mission was also structured like a real space mission, with planning sessions held twice a day, a dedicated telephone line at the cave's mouth to speak to a support team, and daily routines governed by detailed timelines. "The most exciting moments were the times when we were in unknown passages and had to make decisions on how to proceed and how to organize ourselves," Pesquet said. "We encountered underground lakes, had to decide if we used ropes or an inflatable boat … should we continue together or divide into small groups … and so on." European astronaut Thomas Pesquet poses during a "cavewalk". Just like with spacewalks and other extravehicular activities, the CAVES 2011 astronauts had to use a strict tethering protocol to move during the long traverse to reach the exploration area. The astronauts also completed a variety of science objectives along the way, including mapping, photography, monitoring air flow, temperature and humidity. Crewmembers also took geological and microbiological samples as part of their exploration. And even though the astronauts never stepped foot off planet Earth during the CAVES 2011 mission, the expedition was a more accurate spaceflight simulation than you might think. "It took about five hours to come back from the cave to our campsite, requiring technical caving and a support team to help us," Peak said. "We really had a feeling of being far away. When we came back, everything on the surface looked strange: the blue of the sky and other colors looked painted and all the smells of nature were so strong. The real world felt all too real, exaggerated." At the completion of the mission, the crewmembers were debriefed and performed a report on the experience. The data will be used to prepare training runs for the next round of "cavenauts," officials at the European Space Agency said.